When it comes to washing machines, a burst hose can lead to catastrophic damage throughout your home. Drain lines can become clogged. Seals can deteriorate. In dry climates and over time, rubber hoses can lose their elasticity and crack or split. No matter the make and model of your appliance, all washing machines are susceptible to leaking. The good news is you can avoid costly water damage by taking a few simple measures that we’ll highlight in this article. Do not overuse detergent. It sounds simple, but too much detergent can cause oversudsing, which may cause overflow. Also, your drain lines can become clogged. Regularly inspect all washing machine parts and clean front loader door gaskets. Pumps and seals, for example, wear out and can fail over time or because of manufacturer defect. Look for calcium deposits, rust, or other stains on hoses that may indicate where a leak has occurred. Check connectors on a regular basis. Every time you operate your washing machine, those hose connections undergo a level of stress that can lead to problems. Install a single level ball valve and an emergency water shutoff kits. As you can imagine, leaks can cause devastating damage to floors, walls, and nearby appliances. Turn off the water to your washer when you aren’t using it—perhaps when you are out of town. What should you do if your washing machine leaks? Turn off the washer hose valves as soon as you notice water anywhere around your washing machine. Can you readily identify what is causing the leak? Is the hose cracked? 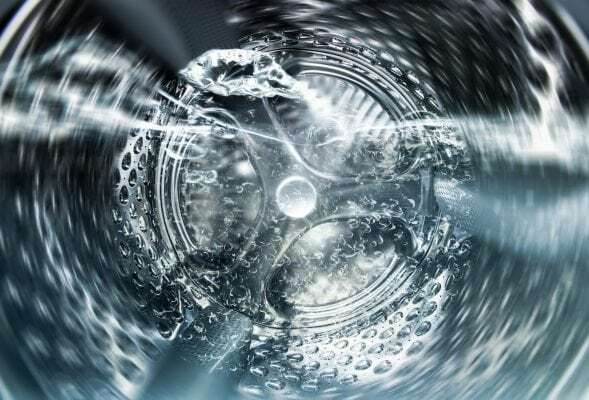 Contact a washing machine repair expert such as our team at Don Bacon. Our appliance repair professionals have the expertise and tools to not only identify the source of your problem, but fix it so that you don’t incur costly damage elsewhere. Contact your trusted appliance repair professional today! At Don Bacon, we recommend an annual inspection of your washing machine. We can proactively identify any vulnerabilities and address them before they become a problem. We’ll know when it’s time to replace worn or old parts. To avoid corrosion, for example, you might consider upgrading connectors and hoses—upgrading rubber to braided metal or coated stainless.